Here is another Recipe using Broken Wheat or Cracked Wheat. 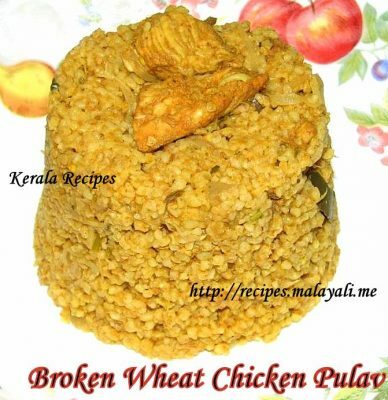 I know I have already posted a Broken Wheat Pulav recipe but this is different. I had some Chicken and wanted to make something spicy for lunch. Since, I didn’t have the patience to make Biriyani, I thought, I should instead make a quick Pulav. That’s when I got the idea of replacing Rice with Broken Wheat for the Pulav. This spicy Broken Wheat Chicken Pulav tasted almost the same as Rice Pulav. We had with it Cucumber Raitha and enjoyed it thoroughly. So if you are on a diet and want to reduce your intake of Rice, I suggest you should try out this Chicken Pulav. It will definitely satisfy your taste buds. Even if you are not on a diet, this spicy Broken Wheat Chicken Pulav is definitely worth a try. I have incorporated Broken Wheat (Dalia) into my diet and now we have Broken Wheat instead of rice, atleast three times a week. I once read that Broken Wheat (Dalia) helps reduce Postpartum weight, specially for South Indians who consume rice almost daily. You can be a bit lenient with the amount of water you use for Broken Wheat recipes. It doesn’t become sticky and mushy as easily as rice. 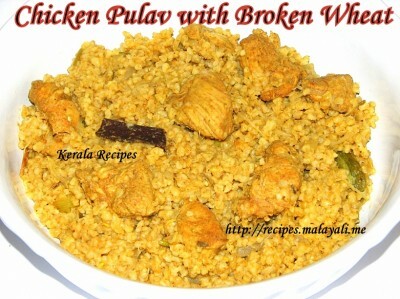 Broken Wheat Chicken Pulav is a one pot dish and is easy to make. Wash the chicken pieces thoroughly and marinate it with all the spice powders and keep it aside for 30 minutes. Wash the broken wheat 4 to 5 times and soak it in water for around 20 minutes. Heat oil in a big non stick pan and add the whole garam masala. Saute until fragrant. Add onions and green chillies and saute until the onions become translucent. Next, add ginger garlic paste and saute for a few minutes. Throw in the chopped cilantro leaves and stir for two minutes. Reduce heat and add turmeric powder, red chilly powder, chicken masala powder, coriander powder and garam masala powder. Saute for a minute. Add the marinated chicken pieces to the pan along with 1/2 cup water and salt to taste. Mix everything well. Cover the pan and cook for around 12-15 minutes on medium heat until the chicken is half cooked. We need atleast 4 cups of water for cooking 2 cups of Broken Wheat. We have added 1/2 cup of water while cooking chicken and also the chicken would have let out some additional gravy (around 1/2 cup). Add 3 more cups of water to the pan and bring to a boil. Drain the broken wheat thoroughly and add it to the pan and mix everything nicely. Reduce heat, cover the pan with a tight lid and cook for around 10-15 minutes on medium low heat until all gravy has been absorbed by the Pulav. Switch off the stove, open the pan and sprinkle lemon juice. Stir gently for a few more minutes until the Pulav is dry. Serve this spicy and tasty Chicken Pulav with any Raitha of your choice.